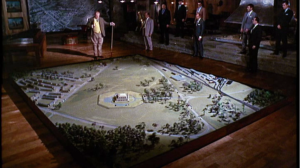 James Bond returns to this blog with a look at the Fort Knox diorama from the 1964 movie Goldfinger. The diorama appears midway through the movie. The titular villain has assembled the top mafiosi from around the U.S. to brief them on his daring plan to raid the gold depository at Fort Knox. They gather in Goldfinger’s lavish briefing room, a superb set designed by Ken Adam with strong Frank Lloyd Wright influences: a vast horizontal expanse of luxurious woods set off with stone walls and a massive fireplace. Goldfinger begins the briefing by flipping a switch on the side of a pool table, which rotates upside down to reveal a large control panel. 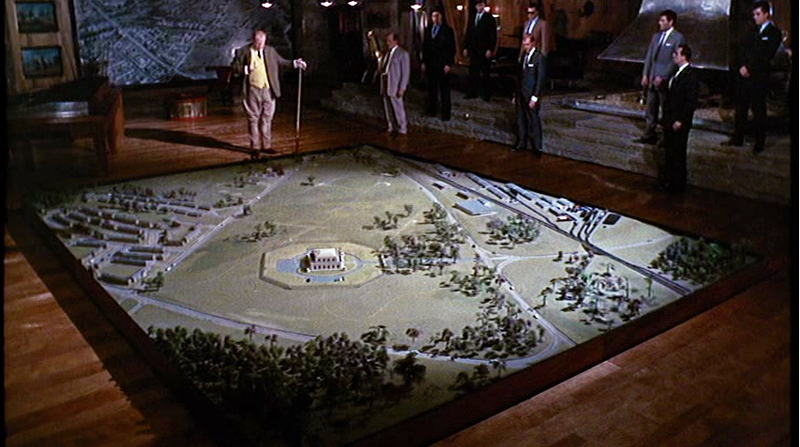 He brings up a wall-size aerial photograph of the Fort Knox vicinity and begins to explain his plan. And then comes the highlight of the scene: a section of the hardwood floor slides aside and a huge diorama of Fort Knox emerges on a motorized lift. The diorama is the focal point of the scene. It’s fully lit, while the surrounding actors remain in the shadows. 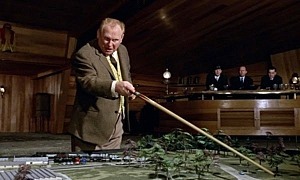 Goldfinger points with a pool cue at various elements of the diorama as he outlines his strategy to break into the most heavily guarded bank in the world. The Bond villains have always been known for their elaborate lairs. These locations are generally big, visually striking, and outfitted with all manner of technological contrivances. And Auric Goldfinger is no exception. He takes great pleasure in dazzling his guests, maintaining an unerring air of superiority as the master villain in the room. 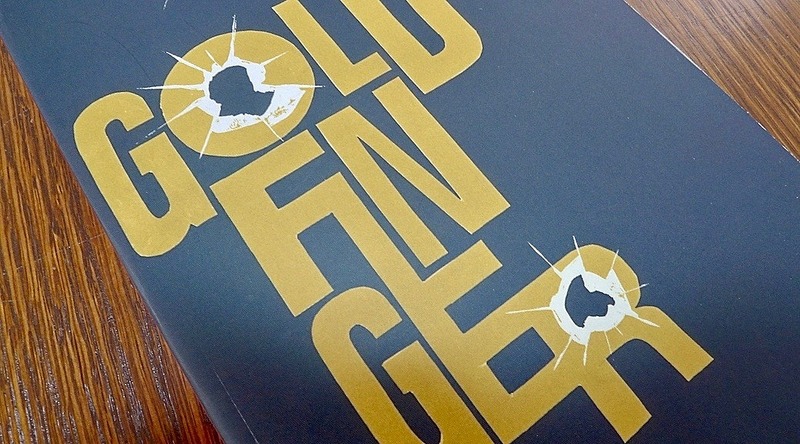 There’s one man in the scene who is unimpressed by Goldfinger’s presentation: James Bond. We find out that 007 has been watching the briefing from a hidden vantage point underneath the diorama. It’s quite amusing, if not entirely believable, when we see Bond’s eyes behind the Fort Knox model, and none of the characters notice. Bond’s irreverent lurking completely deflates the grandiosity of the scene and robs Goldfinger’s presentation of its dignity. Once again, 007 gets the better of a criminal mastermind.